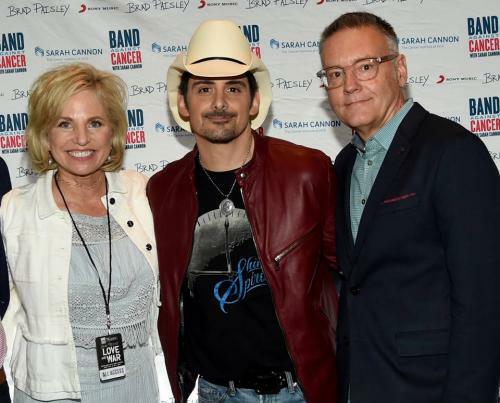 Sarah Cannon, the Cancer Institute of HCA (NYSE: HCA), in partnership with Country superstar, Brad Paisley, and Sony Music Nashville, announced today the 2017 launch of Band Against Cancer. Activated through a series of content and ambassador-led integrations, the movement unites music and healthcare–two of the most influential industries–to help connect those touched by cancer with community-based treatment options and resources. As part of today’s launch, Paisley is providing an opportunity for his fans to engage in the cause, rolling out a ‘Get One, Give One’ campaign for his new album LOVE AND WAR (released Friday, April 21). When fans purchase the new album for a special limited time price of $15 via www.bandagainstcancer.com and www.bradpaisley.com, they can send an additional free copy to a patient going through the cancer journey. Additionally, Paisley will anchor a national social and digital initiative engaging people coast to coast so every follower can help fight cancer. Paisley’s cross-country summer tour also will feature Sarah Cannon as a sponsor and will culminate in Nashville with a special performance at the Grand Ole Opry® this fall. Further, national awareness campaigns with iHeart Media, Premiere Networks, Cumulus Media and Westwood One will align with Band Against Cancer. The second year of Band Against Cancer launched today with a 32 outlet broadcast event, encompassing local radio stations, syndicators, bloggers, influencers, digital outlets and television partners. In addition to interviews with Paisley and Sarah Cannon CEO, Dee Anna Smith, listeners across the country were treated to interviews LIVE from the Country Music Hall of Fame & Museum (where Paisley’s exhibit Diary of a Player is displayed). LOVE AND WAR collaborators, including Country Music Hall of Famer Bill Anderson, Rock ‘N Roll Hall of Famer John Fogerty, Timbaland, Producer Luke Wooten, Sony Music Nashville CEO Randy Goodman, Fitzgerald Hartley Partner Bill Simmons, and Country Music Hall of Fame & Museum CEO Kyle Young, all took part in the LOVE AND WAR album launch event. To learn more about how you can help, visit www.bandagainstcancer.com. Sarah Cannon, the Cancer Institute of HCA (NYSE: HCA), offers integrated cancer services with convenient access to cutting-edge therapies for those facing cancer in communities across the United States and United Kingdom. Sarah Cannon’s cancer programs include individualized patient navigation provided by oncology-trained nurses, more than 1,000 stem cell transplants performed annually throughout the Sarah Cannon Blood Cancer Network, more than 500 clinical trials, and molecular profiling capabilities. Sarah Cannon also offers a helpline, askSARAH, so that people with cancer questions can talk to a registered nurse and receive trusted information. Through its services, Sarah Cannon is providing state-of-the-art cancer care close to home for hundreds of thousands of patients, a number unmatched by any single cancer center. To learn more about Sarah Cannon, visit sarahcannon.com and to reach askSARAH, visit asksarahnow.com.